Cockroach is the common name for any insect in the order (or suborder) Blattodea (= Blattaria) in the superorder (or order) Dictyoptera, characterized by an oval, flat-bodied shape, leathery wings, long antennae, long legs, and a flat extension (or thoracic shield) that extends dorsally to conceal the head. There are more than 3,500 species of cockroaches. The cockroach group is very old, with abundant fossils traced to over 320 million years ago (mya) from the Carboniferous period (359 mya to about 299 mya). This makes them one of the oldest of fossilized insects and they may have been the first flying animals. Cockroaches generally have an unfavorable reputation as slimy, smelly, food-consuming pests that are vectors of human diseases. They do produce disagreeable odors from some glandular secretions and do consume various household items (food, paper, clothing, and so forth), but they tend to be fastidious and there is a lack of evidence that they spread diseases. They do, however, produce allergic reactions in some people. However, only a relatively few species of cockroaches (maybe one percent) infest homes. In general, they are important ecologically as part of food chains, being consumed by various predators (such as bats, birds, and spiders) as well as by parasites. Even the feces of cockroaches are consumed by some animals. And cockroaches do provide some direct value to human beings in terms of being used in scientific research and adding to the wonder of nature. Cockroaches are also known as "roaches" or as "cucarachas" in Spanish (from cuca for caterpillar). The name comes from the Spanish, by way of the obsolete word cacarootch. The scientific name derives from the Latin word for "cockroach," blatta. As arthropods, cockroaches have jointed appendages, an exoskeleton (hard, external covering made mostly of chitin), segmented body, ventral nervous system, open circulatory system, digestive system, and specialized sensory receptors. As insects, they are characterized by three pairs of jointed legs; an abdomen that is divided into 11 segments and lacks any legs or wings; and a body separated into three parts (head, thorax, and abdomen), with one pair of sensory antennae on the head. Cockroaches are classified as "true insects" (that is, species classified in the Class Insecta). True insects are distinguished from all other arthropods in part by having ectognathous, or exposed, mouthparts. This is the reason they are sometimes termed Ectognatha, which is synonymous with Insecta. 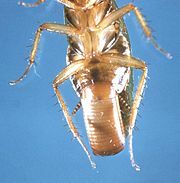 Cockroaches are classified in the superorder (or order in some classifications) Dictyoptera. The use of the term Dictyoptera has changed over the years, and while largely out of use for much of the last century, it is becoming more widely used. It is presently usually considered a superorder, with Isoptera (termites), Blattodea or Blattaria (cockroaches), and Mantodea (mantids) being its three orders. 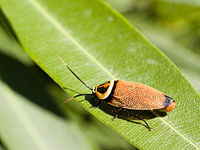 In some classifications, however, Dictyoptera is shifted to order status, and Blattodea or Blattaria to suborder status. Regardless, in all classifications, the three constituent groups are the same, just treated at different rank. Although all modern Dictyoptera have short ovipositors, the oldest fossils of Dictyoptera have long ovipositors, much like members of the Orthoptera. Cockroaches live in a wide range of environments around the world, with tropical and subtropical the most common climates and with the greatest diversity in the tropics. Some species (perhaps about 20 species of the 3,500 species) have adapted to human habitations and have become household pests. These include tropical species living in homes in temperate zones. Cockroaches range in size from just about 1/2 centimeter (1/4 inch) to 9 centimeters (3 1/2 inches). 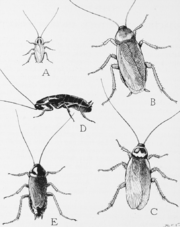 Among the most well-known species are the American cockroach, Periplaneta americana, which is about 3 cm long; the German cockroach, Blattella germanica, about 1½ cm long; the Asian cockroach, Blattella asahinai, also about 1½ cm in length; and the Oriental cockroach, Blatta orientalis, about 2½ cm. Tropical cockroaches are often much bigger, and extinct cockroach relatives such as the Carboniferous Archimylacris and the Permian Apthoroblattina were several times as large as these. The world's largest extant cockroach is the Australian giant burrowing cockroach, which can grow to 9 cm (3 1/2 inches) in length and weigh more than 30 grams. Comparable in size is the giant cockroach Blaberus giganteus, which grows to a similar length but is not as heavy. Cockroaches tend to have a flat, oval body shape with long legs, long antennae, and a flat extension on the dorsal side that covers the head. The body covering tends to be shiny and leathery and dark in color (brown or black), though some are bright colors, such as reds, yellows, and greens. Some cockroaches have two pairs of wings and can fly well, while others have reduced wings or they are absent. The household pests tend to run and not fly despite wings. Insects do not have lungs and thus do not actively breathe in the vertebrate lung manner. However, in some very large insects the diffusion process may not be sufficient to provide oxygen at the necessary rate and body musculature may contract rhythmically to forcibly move air out and in the spiracles and one can actually call this breathing (Kunkel 2007). Cockroaches reproduce by sexual reproduction. Female cockroaches are sometimes seen carrying egg cases or capsules, called oothecae, on the end of their abdomen. They typically are dropped and then hatch, but some species retain them on the body until hatching and some even in the body of the female. The eggs hatch from the combined pressure of the hatchlings gulping air and are initially bright white nymphs that continue inflating themselves with air and harden and darken within about four hours. Their transient white stage while hatching and later while molting has led to many individuals to claim to have seen albino cockroaches. A female German cockroach carries an egg capsule containing around 30 to 40 long, thin eggs, packed like frankfurters. She drops the capsule prior to hatching. Development from eggs to adults takes 3-4 months. Cockroaches live up to a year. The female may produce up to eight egg cases in a lifetime; in favorable conditions, it can produce 300-400 offspring. Other species of cockroach, however, can produce an extremely high number of eggs in a lifetime, but only needs to be impregnated once to be able to lay eggs for the rest of its life. Cockroaches are generally omnivores. An exception to this is the wood-eating genus Cryptocercus, with various species found in Russia, China, Korea, and the United States. Although they are incapable of digesting the cellulose themselves, they have a symbiotic relationship with a protozoan that digests the cellulose, allowing them to extract the nutrients. In this, they are similar to termites and current research suggests that the genus Cryptocercus is more closely related to termites than it is to other cockroaches. Cockroaches are among the hardiest insects on the planet, some species capable of remaining active for a month without food, or being able to survive on limited resources like the glue from the back of postage stamps (Mullen and Durden 2002). Some can go without air for 45 minutes or slow down their heart rate. Cockroaches can survive sterile surgical decapitation for a very long period, especially if recently fed, but of course become unable to feed and die within a few weeks (Choi 2007). It is popularly suggested that cockroaches will "inherit the earth" if humanity destroys itself in a nuclear war. Cockroaches do indeed have a much higher radiation resistance than vertebrates, with the lethal dose perhaps 6 to 15 times that for humans. However, they are not exceptionally radiation-resistant compared to other insects, such as the fruit fly (ABC 2007). The cockroach's ability to withstand radiation better than human beings can be explained in terms of the cell cycle. Cells are more vulnerable to effects of radiation when they are dividing. A cockroach's cells divide only once when in its molting cycle, which at most happens weekly in a juvenile roach. The cells of the cockroach take roughly 48 hours to complete a molting cycle, which would give time enough for radiation to affect it but not all cockroaches would be molting at the same time. This would mean some would be unaffected by the initial radiation and thus survive, at least until the fallout arrived (Kunkle 2007). Cockroaches have been shown to exhibit emergent behavior, a property when a number of simple entities (agents) operate in an environment, forming more complex behaviors as a collective. (Viegas 2006). Research has shown that group-based decision making is responsible for more complex behavior such as resource allocation. A study where 50 cockroaches were placed in a dish with three shelters with a capacity for 40 insects in each, the insects arranged themselves in two shelters with 25 insects in each, leaving the third shelter empty (Viegas 2006). When the capacity of the shelters was increased to more than 50 insects per shelter, all of the cockroaches arranged themselves in one shelter. Researchers found a balance between cooperation and competition exists in group decision-making behavior found in cockroaches. The models used in this research can also provide insights on the group dynamics of other insects and animals (Viegas 2006). Another study tested the hypothesis that cockroaches use just two pieces of information to decide where to go under those conditions: how dark it is and how many of their friends are there. The study conducted by José Halloy and colleagues at the Free University of Brussels and other European institutions created a set of tiny robots that to the roaches appear to be other roaches and can thus alter the roaches perception of critical mass (Lemonick 2007). Research being conducted at the University of Florida shows that cockroaches leave chemical trails in their feces. Other cockroaches will follow these trails to discover sources of food and water, and also discover where other cockroaches are hiding. One of the major implications of this research is a new technique in cockroach pest control. Cockroaches could potentially be removed from a home by leaving a chemical trail that leads away from the home. Additionally, researchers at Tohoku University engaged in a classical conditioning experiment with cockroaches and discovered that the insects were able to associate the scent of vanilla and peppermint with a sugar treat (Parry 2007). The earliest cockroach-like fossils are from the Carboniferous period between 354–295 million years ago. However, these fossils differ from modern cockroaches in having long ovipositors and are the ancestors of mantids as well as modern cockroaches. The first fossils of modern cockroaches with internal ovipositors appear in the early Cretaceous. Mantodea, Isoptera, and Blattodea are usually combined by entomologists into a higher group called Dictyoptera. Current evidence strongly suggests that termites have evolved directly from true cockroaches (BBC 2007). If this is the case, then Blattodea excluding Isoptera is not a monophyletic group and the Isoptera are actually a family (or epifamily) of cockroaches. Oriental cockroach (Blatta orientalis). a, female; b, male; c, side view of female; d, young. Cockroaches have a generally unfavorable reputation as smelly (because of various glandular secretions yielding a highly disagreeable odor), food-consuming pests that are vectors of human diseases. The first two aspects are accurate—and indeed, they also consume paper, clothing, and plastic—but there is a lack of evidence that they spread diseases. However, they do produce allergic reactions. A 2005 US national study on factors that affect asthma in inner-city children shows that cockroach allergens appear to worsen asthma symptoms more than other known triggers. This study, funded by the US National Institute of Environmental Health Sciences (NIEHS) and the US National Institute of Allergy and Infectious Diseases (NIAID), is the first large-scale study to rank asthma triggers according to severity. Additionally, a 2005 research study, sponsored by the National Pest Management Association (NPMA), shows a disparity in homeowner knowledge about this link. Only ten percent of homeowners in the United States feel that cockroaches are a threat to their family's health. Cockroaches do provide some direct value to human beings in terms of being used in scientific research. Ecologically, they are integral to various terrestrial food chains. Some of the earliest writings with regards to cockroaches encourage their use as medicine. Pedanius Dioscorides (first century), Kamal al-Din al-Damiri and Abu Hanifa ad-Dainuri (ninth century) all offered medicines that either suggest grinding them up with oil or boiling. The list of ailments included earaches, open wounds and "gynecological disorders." In popular culture, cockroaches are often regarded as vile and extremely resilient pests, due to their shiny exoskeletons (making them look slimy, contrary to their fastidious habits), and their size, unusual for a scavenging insect. As such, many movies, television shows, and books feature cockroaches in less than flattering terms. 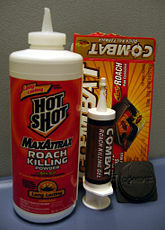 Cockroach control, with cockroach baits, boric acid, and hydramethylnon gel. There are numerous parasites and predators of cockroaches, but few of them have proven to be highly effective for biological control. Wasps in the family Evaniidae are perhaps the most effective insect predators, as they attack the egg cases. Wasps in the family Ampulicidae are predators on adult and nymphal cockroaches (e.g., Ampulex compressa). The house centipede, however, is probably the most effective control agent of cockroaches, though most homeowners find the centipedes themselves objectionable. Preventative measures include keeping all food stored away in sealed containers, using garbage cans with a tight lid, frequent cleaning in the kitchen, and regular vacuuming. Any water leaks, such as dripping taps, should also be repaired. It is also helpful to seal off any entry points, such as holes around baseboards, in between kitchen cabinets, pipes, doors, and windows with some steel wool or copper mesh and some cement, putty, or silicone caulk. Once a cockroach infestation occurs, chemical controls may help alleviate the problem. 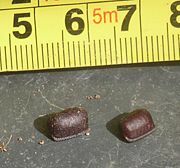 Bait stations, gels containing hydramethylnon or fipronil, as well as boric acid powder, are toxic to cockroaches. Baits with egg killers are also quite effective at reducing the cockroach population. Additionally, pest control products containing deltamethrin are effective. In Asia, car owners are known to use Pandan leaves as a natural cockroach repellent in their vehicles (Li and Ho 2003). Australian Broadcasting Corporation (ABC). 2007. Cockroaches & radiation]. ABC. Retrieved December 1, 2007. Bell, W. J., L. M. Roth, and C. A. Nalepa. 2007. Cockroaches: Ecology, Behavior, and Natural History. Baltimore : Johns Hopkins University Press. ISBN 0801886163. British Broadcasting Corporation (BBC). Termites are "social cockroaches.". BBC April 13, 2007. Retrieved December 1, 2007. Choi, C. 2007. Fact or fiction? A cockroach can live without its head. Scientific American March 15, 2007. Retrieved December 1, 2007. Klausnitzer, B. 1987. Insects: Their Biology and Cultural History. ISBN 0876636660. Kunkel, J. G. 2007. The cockroach FAQ. Morrill Science Center, University of Massachusetts Amherst. Retrieved December 1, 2007. Lemonick, M. D. 2007. Robotic roaches do the trick. Time Magazine November 15, 2007. Retrieved December 1, 2007. Mullen, G. R., and L. A. Durden. 2002. Medical and Veterinary Entomology. Boston: Academic Press. ISBN 0125104510. O'Toole, C. 2002. Firefly Encyclopedia of Insects and Spiders. Buffalo, N.Y.: Firefly Books. ISBN 1552976122. Parry, W. 2007. Pavlovian cockroaches learn like dogs (and humans). Discover Magazine. Retrieved September 5, 2007. Viegas, J. 2006. Cockroaches make group decisions. Discovery Channel. Retrieved June 10, 2006. Blattodea Species File – Online world catalog of cockroaches. The Virtual Cockroach: Insect anatomy. This page was last modified on 7 March 2017, at 17:42.